Kinisimere Ravi has been recognised with a Fiji Sports Volunteer Award for her commitment to football development in Fiji. Often it is the people behind the scenes which make or break the success of an event or programme and in Fiji the hard work of Kinismere Ravai has been recognised with the 2017 Fiji Sports Volunteer Award. 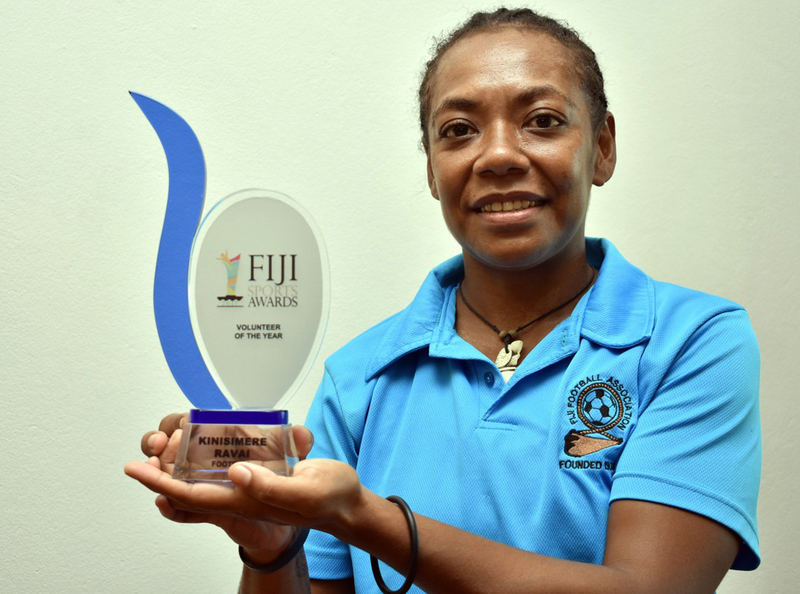 Ravai’s outstanding commitment to the Fiji Football Association and the OFC Just Play programme was recognised at last month’s awards ceremony and said it was a proud day for her and her family. “I am very happy and proud that I have been honored for my hard work,”Ravai said. Ravai said this was the first time she had won something at the Fiji Sports Awards, and had previously been nominated by Fiji FA for FASANOCs Voices of the Athletes Champion in 2012. The 36 -year -old passionate sportswoman, who hails from Soa, Nakorotubu, has volunteered and played many different sporting arenas. “I first started playing football in 1998 and then I played softball, shooting, hockey and rugby,” Ravai said. The former Fiji international was grateful to Fiji FA for nominating her for her services to the OFC Just Play programme where she has been a volunteer since 2009. “I have been volunteering for Fiji FA for the past eight years, I first started in 2009 when the OFC Just Play programme was first introduced in Fiji. Although she has played across many different disciplines, football remains very close to Ravai’s heart having represented the country in a number of regional events. Ravai said she always believed in almighty first. She dedicated her award to all the volunteers and families and friends. “I dedicate this to all the volunteers and I would advise them to continue their hard work and a day it will be paid off. For Ravai that pay off has come in the form of a full-time job with Fiji FA as a Just Play instructor and coordinator.